The Barberton Daisy, Gerbera Jamesonii, derives its name from its geographic origin. Barberton is a town south of Nelspruit in the Lowveld and it was here, in the granitic soils, that the early gold diggers first saw this beautiful flower towards the end of the 19th century. It grows well in subtropical climes and is a very popular garden flower. I was given some seeds by the late Gert Viljoen, husband of Janetta (who now works for Viva) and past manager of Orpen camp in the Kruger Park. 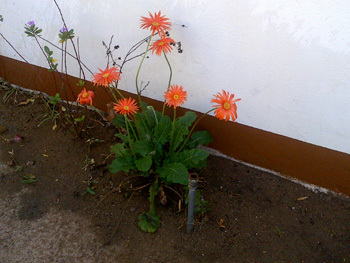 We planted these seeds at Tremisana Lodge and the photo below is of flowers outside our guide Luke’s room. So far so good – Luke has not picked any Barberton daisies for some of the pretty girls he always seem to have on his game viewing vehicle! Janetta would love to plant some Barberton daisies at Marc’s Camp but the Nyala would rapidly eat them all. 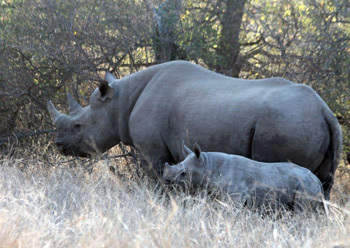 During our bushwalk we came across a mother and baby black rhino browsing. The baby was running around and looking at us for a long time. They started feeding again and moved towards the stream. Behind us were two giraffes looking at us. I was so happy about the black rhino sighting that I had forgotten to look around us. After a few minutes we heard branches breaking and we knew that there were elephants moving through the bush. We tried to approach the elephants but it was difficult due to the wind direction changing constantly. The elephants moved towards the Olifants River and we followed them until they reached the water. It was amazing to be so close to huge, dangerous animals. On the other side of the river Baboons were alarm calling – we suspected that there were lions or a leopard in the area. It was a sunny day and everyone was excited about visiting Kruger National Park. The guests were looking forward to spotting many varieties of animals. I asked the guests about the animals they wanted to see and answered the questions they had directed to me. A few kilometres from Orpen gate were a big group of elephants feeding along the road, moving slowly towards the Timbavati River to drink water. One of the Kruger National Park rangers told us about lions eating a buffalo next to the road. I drove straight to the sighting. Before the kill we had spotted a mating pair of lions on the road – it was a beautiful sighting and enjoyable. One of my guests had been looking at some bird on top of a tree as it was making a beautiful sound. Guess what – he found a leopard sleeping on another branch of the tree. It was watching the lions. Further on we had a brilliant sighting of 4 male lions on a freshly killed buffalo – right on the road ! It was difficult to drive past the lions because they were right on the road. At Nsemani dam there were eighteen lions eating a dead hippo in the water, but it was not easy for them because of the presence of a huge crocodile. The lions tried to pull the carcass out of the water but the crocodile pulled it back into the water. It was interesting to watch two different species fighting over meat! The lions were making lots of noise, trying to scare the crocodile, but it didn’t work because of the strength of the crocodile in the water. We departed before the fight had finished. We came back after lunch but the lions had moved away from the hippo carcass. On our way out we found two White Rhinos drinking water along the Timbavati River. After drinking, they started moving towards the road and crossed over right in front of us! We enjoyed watching them so close. We found all of the big five in one day! August is one of the best seasons to do a safari in South Africa! We constantly spot a large variety of animals. It will remain good until the rains come. 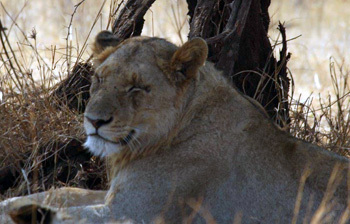 The highlights list for August is dominated by lion sightings, either eating or lying in the shadows sleeping. The Kruger National Park hasn’t received much rain since the beginning of the winter months, and is therefore becoming very dry. Nsemani dam has become a great place to see huge animal concentrations and to watch large herds of buffalo and elephant make their way down for a drink of water. The high concentration of animals around the water holes has made finding the lions easier in the winter months. Sightings of lions eating a range of animals, such as hippo, giraffe and the most popular one being buffalo, have given my guests some superb close up views of these large cats filling their stomachs. The best sighting involved up to seventeen lions, in a dry river bed, feasting on a giraffe. I had received an update in the morning, while heading along the Orpen road, regarding a lion kill down towards Tshokwane. We headed off and managed to find a few of our own lions along the way, resting in a dry river bed which made the trip even more successful, let alone the leopard sighting a little further down! We eventually got to the area where the lions had been sighted and it was an incredible scene. The giraffe had mostly been eaten, except for a few scraps. A group of hooded vultures and a very brave, little black-backed jackal were waiting patiently to grab some of these scraps as soon as the lions looked away. The only thing standing in his way was a very young lion cub that was ripping off little bits of flesh and filling up its little belly while its mother was watching on, ready to pounce if the vultures got any closer. Further back from the giraffe kill were a pride of lions lying with their bellies and feet in the air, looking very content with life. The leopard, mentioned above, was a very pleasant surprise! I had been gazing into the distance looking for a possible view of a rhino, when I heard a loud stomp from the back of the vehicle. There next to us, just off the road, was a big male leopard resting in the shade! It wasn’t long before he stood up and slunk into the thick vegetation, but a very good sighting none the less! The rhino sightings have improved, as the vegetation is a lot thinner than in the summer months. A particularly good sighting took place along the Orpen road whilst on our way towards the gate. My group of guests were all photographic enthusiasts, and had been hoping to find a rhino close by in the late afternoon light. Let’s just say they got very lucky…there just off the road stood a big bull white rhino, grazing away in the open. The light was just perfect and my guests managed to get some excellent photographs. On the 13th August 2014 my guests and I began the day at the Moholoholo Rehabilitation Centre. They enjoyed interacting with both mammals and birds and learnt a lot about conservation matters. Following lunch at the Italian restaurant in Hoedspruit ( highly recommended by the GM), we headed to Kruger National Park for the afternoon. 15 kilometres along the Orpen Road the guests and I spotted four male lions which had killed a male buffalo. There were supposedly another two male lions in the area but they weren’t visible. One of the male lions made his way down towards the Timbavati River to drink some water. Whilst at the river my guests and I spotted elephants that were drinking water accompanied by buffalo lying on the sand bank. On further inspection of the carcass the guests and I only saw one male lion eating while the other lions were resting. We eventually left the lions to the carcass around 4:30pm. The guests and I found a giraffe browsing close to the road on an acacia tree. Unfortunately this giraffe had a serious wound and was finding it difficult to move around. For the past week you would have been considered very unlucky if you hadn’t seen the big five in Kruger National Park! On arrival at the Orpen gate on the 15th of August 2014 we spotted a few male buffalo drinking water at the waterhole. Approximately 10 kilometres from the gate a herd of elephants were crossing the road. The young bull elephants decided to tease us by mock charging us! As we were watching the elephants a private vehicle appeared and advised us about a leopard sighting in a tree and lions mating on the opposite side of the road, about 2 kilometres away! Our timing was perfect as we got to view the lions mating! The leopard was still lying in the tree nearby. This leopard was very young, possibly two years old. The lions that we had viewed the previous day, which were eating off of the buffalo kill, were still in that area. These lions however had pulled the carcass into the bush, approximately 20 metres deeper into the bush. The remains were very scarce, with only the ribs and head remaining. 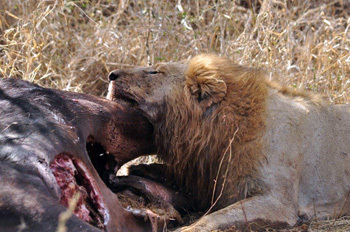 At Nsemani Dam, along the stream, a pride of lions were eating a dead hippo. Half of the carcass was situated in the water. The crocodiles had also taken part in the feeding frenzy! There was a tug-of-war competition between the lions and crocodiles. The crocodiles were trying to drag the carcass deeper into the water while the lions were trying to drag the carcass out of the water! This was one of the rarest experiences I’ve had and I was very pleased to have my guests experience this first hand! On the 11th August 2014 I took a full vehicle of tourists to Kruger National Park and had a great day! The first sighting we were privileged to experience was of a male leopard, which was marking his territory nearby the river. We were lucky to spend a decent amount of time with this male leopard. The next sighting we experienced were the herd of elephants that crossed in front of us on the road. The calves were also playing in the road which my lucky guests and I really enjoyed. After a few kilometres we encountered a large group of male buffalos. Following lunch at Satara, we headed down Olifants Road and spotted a male rhino that was sleeping. Unfortunately the rhino was situated quite far from us so we had to make use of a pair of binoculars. As we moved along the S90 we spotted another leopard, this time situated in a tree, and spent about 30 minutes at this sighting. He suddenly leapt down from the tree and made his way towards the road! The guests and I had a perfect view of this leopard especially as he crossed the road! The following day my guests and I came across three male lions at a buffalo kill, which was situated nearby the road. On the Orpen road we had a great sighting of a single male lion. We were lucky to also view a cheetah in the distance and a few White Rhino near the waterhole. After having a break at Satara Camp, we drove around and viewed large herds of general game. These included zebra, waterbuck, impala and giraffe. Just south of Nsemani Dam we spotted a large gathering of vultures. As we drove to the side of the water we spotted lions that were feeding off of a hippo. The male lion was feeding on the hippo and the female lion was standing on top of the dead hippo. We had a brilliant sighting of a massive male lion and three lionesses. The guests and I viewed these lions until the sunset by which time they became more active, making their way down towards the water hole to drink water. We followed these lions to the water. They eventually settled on the dam wall and that’s where we left them. We spotted a few bushbabies and chameleons. My guests and I travelled to the enchanting Marula Boma where the grateful guests enjoyed a real, authentic, delicious South African bush braai! The following morning my guests and I made our way out on the Sunrise drive. Besides the beautiful view of the sun rising over the bush, we also got a very exclusive sighting of a female cheetah on the road! We followed this female cheetah for approximately an hour! When we left the cheetah we bumped into a pack of Wild Dogs, which we followed for about 20 minutes before losing sight of them. The morning bush walks were absolutely amazing! My guests and I were fortunate enough to get perfect views of the Black Rhino. 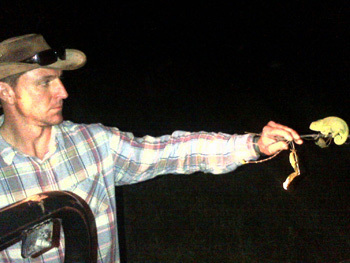 Being able to get a close view of such a dangerous animal, on foot no less, intrigued our guests immensely! As we ended our bushwalk we came across a majestic male leopard that was crossing the road! The bushwalks that we have been experiencing this month have been unforgettable! We have been able to identify many different types of tracks from multiple animals. On a few occasions we had shown our guests how to make toothbrushes from the magic guarri (euclea divinorum). We also explained to the guests the variety of traditional beliefs that were relevant to certain types of trees. It’s been another amazing month here at Viva, full of more amazing sightings!! With August being the peak of our winter and dry season, the bush is very open and makes game viewing of large animals absolutely amazing! The walks this month down by the Olifants River have been really good, as all the animals are concentrating around the river where there is a permanent water source and green vegetation. The river area is full of signs of animal activity – the tracks and signs tell it all as well as the animals themselves. Sightings of Black rhino in particular on walks have been exceptional this month, picking up tracks almost daily, and had amazing on foot encounters with four different individuals including a mother and her calf. It is always a special experience to see and show my guest the black rhinos, as they are critically endangered with numbers less than 2,500 in the wild. The black rhino is also the most dangerous to encounter on foot, so guests rarely get the opportunity to stand amongst these nervous unpredictable animals, that have a reputation for charging!! Our Safety, as well the animals is the main priority on walks, by doing that we have had some really amazing encounters. We still enjoy the company of the impalas, baboons, hippos, and crocodiles that we usually have been seeing, almost every walk. My favourite sighting this month, on walk, was seeing a Cape clawless otter!! It’s only the second one I have ever seen, it was very cool!! The morning, afternoon and sunset drives have been just as good for sightings as the walks. On two of my Sunrise drives I was privileged to show my guests cheetah and leopard!! I have been going down to the river a lot on afternoon drives and had beautiful sightings of lions, black rhino, elephant, lots of general game and more. Male lion – King of Balule! The sunset drives have been really good, I have had absolutely amazing sightings of our big beautiful male lion and 3 females that have been hanging around a lot in the area. The one afternoon I found them lying next to a dam, and was able to spend 45 minutes just watching them all around the game viewer, the guest loved it!! I have also been seeing lots of big herds of elephants and buffalo that have been moving through as well. This month I have not only had amazing sightings but also really nice, friendly and enthusiastic guests from all over the world. I always love to talk to the guests and share stories and experiences. It has been another fantastic month with the staff, guests and just the positive vibe; I am really enjoying working for Viva! I had a full vehicle when we set off on our full day Kruger adventure. The bar had been set with my guests already having been in Kruger with Luke the day before, having seen 3 out of 5 but no cats so I had made it my mission to find some elusive cats. We started the day off with a brilliant elephant sighting just after the reception of Orpen, a beautiful breeding herd to be exact, which were walking alongside both sides of the road so as we passed the area we were completely immersed in the herd. The baby elephants were giving us quite a show being brave and running towards us then hiding behind mom, so we had a few good laughs with them before moving off. Already the spirits were high, having that elephant sighting as soon as we had entered into Kruger but this was nothing on the day to come! After the elephants we moved on down the road getting beautiful sightings of all the antelope, some big bull kudus and, of course everyone’s favourite animal, the impala. A bit of a distance down the road we stopped a car and the driver let us know of a few lions on a kill and instantly we got excited! We quickly made our way there, trying to contain the excitement, but I did inform my guests that it might be a little busier than the sightings in Balule but nevertheless we made our way there. As we approached the sighting we saw a huge bus and instantly thought it was going to be rather hectic with getting in but to our surprise there weren’t many cars and we easily made our way in and an even better surprise was that it was 4 male lions on a buffalo kill right next to the road with perfect visual not many cars on the sighting! This was brilliant and we had an amazing time with the lions giving us some good shots with the camera and even posing for a few photos before we made our way off again to see what we could find! A few km’s down the road we decided to go another way and check the dirt roads, hoping to find any rhino or buffalo along the way, but we were greeted with buffalo at the very end of the road before lunch, again at a distance, so I wasn’t too happy but knew we might get some others down the road. We decided to stop for lunch and then take it as it comes after lunch and see what we could find! Just after lunch we moved around a bit before making our way down to the one big dam. Soon after arriving at the dam, where the hippos were playing, I noticed some vultures in the tree and decided to check it out on a little dirt road that no one ever really uses. To my great surprise I found more lions! After sitting with them for a while, I noticed what I thought was a giant rock in the water which happened to be a dead hippo on which the lioness was sitting and the male lion in the water was eating! Again, after that a crocodile decided to join the party but was quickly dismissed by the lions roar, after all this we made our way back to the dam and saw a beautiful breeding herd of buffalo coming down to drink at the dam. It must have been about 500 strong in that herd if not more but it was an amazing sight to see! We continued on our way getting some sightings here and there, sadly the rhino sighting we saw wasn’t the best as it was a bum shot and he was sleeping in the river bed but never the less a rhino, so we were 4 down with one more to go and all hopes were high as we pressed on toward the exit, we had a beautiful sighting of elephants sleeping in the riverbed but I noticed a car jam up ahead and wanted to make my way there, before getting there a car stopped me and told me, LEOPARD!! We had found it finally, after much driving and searching, we had a brief view of the leopard as it ran across the road and again as it made its way next to the road but sadly it was a very shy girl and didn’t stick around for long. All in all it was an amazing day I was over the moon thrilled with the sightings we had!! And so were the guests, the animals that day were very co-operative with regards to photos so it was an amazing day in the end! Honey Badgers don’t care except when feeding. A young honey badger was seen running around the burnt area foraging. About 20 metres away, a pair of ground hornbills were busy digging in the nearby area. The honey badger decided to chase ground hornbills from their food. This sighting occurred in the Tamboti area. It was a great way of viewing the inter-specific competition. Helmeted guinea fowls gathered around the water at a pond nearby the Timbavati dry riverbed. A young male leopard hopped down the sand bank trying to catch one of the guinea fowl. The birds disappeared to the trees and the leopard chased them up the tree! The guinea fowl flew out the tree so this male leopard gave up the chase and made his way to the water to drink. Due to the age of this young, male leopard (being approximately one year old) you can see that the hunting techniques he uses need to be practised. Black rhinos can be considered a great sighting, more than the white rhinos, because of their adaptations. During the morning walk around our traversing area, we had walked across the animal paths. About 50 metres on this path a female black rhino was gazing out towards a crow passing overhead. Luckily Musa happened to spot this female rhino and stopped the trail to look. Half of the guests got a perfect view of here before she disappeared into the thick bush. We tried to relocate her and on doing so we discovered she had a calf. 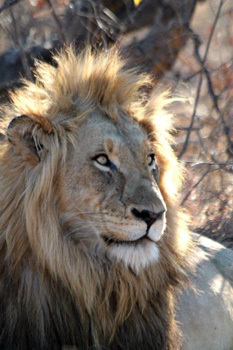 Nsemani pride in Kruger consists of four young male lions, five lionesses and five young lionesses. This is a total of fourteen lions in this pride. They happened to be located near the back loop water hole and were busy feeding on a hippo! Some of the lions were on their backs in the mud on the bank of the waterhole whilst a few others were trying to feed and even drag the hippo carcass out of the water. This showed the instinctive nature of these cats in terms of crocodiles taking this kind of kill. There were many vultures in the area as well. A pack of wild dogs were located in the Olifants/Campfire area. The dogs were seen running and hunting in the afternoon. Commonly these wild dogs hunt twice a day. We viewed an elephant cow and two adolescent elephants at the waterhole on Olifants Road. A White rhino bull approached the area and the young elephant bull tried to charge the rhino bull! The rhino kept coming towards the young elephant so the young elephant ran to the elephant cow. The rhino kept on trying to charge at the young elephant bull but backed off when the elephant cow moved closer. The young elephants moved away towards the river. The Phelwane pride consisting of twelve lions came up against 400 buffaloes. The buffalo were drinking water at Timbavati pool. Once the buffalo had finished drinking water the lions began to follow them. The lions attempted to attack the buffaloes three times but were unsuccessful! The lions eventually gave up and lay out on the road approximately 20 metres from the heavy traffic congestion of the people that had been viewing this hunt. It was very interesting to see how the buffalo were grouping themselves together while the lions were trying to isolate a single buffalo! We bid farewell to winter and welcome spring. Warmer days and an extra reason to stay in the pool. The gardens look more luscious and beautiful as the flowers and vegetation come back to life. The setting in of spring also means an earlier start to our programs. The bushwalk now starts earlier giving our guests a lovely experience of the Balule Sunrise. We have also extended the times for the afternoon drive to ensure that our guests have a better chance of seeing more animals. Our Vervet monkeys are still around and faithfully attend breakfast as always. Even though they give a bit of trouble we still love them all the same. We have had a lot of animal sightings around the lodge. We see on a daily basis warthogs as well as the graceful giraffes. A large herd of buffaloes has been frequenting our backyard. We have a wide variety of birds including my all time favorite grey loerie. This has all been a source of joy for our guests lounging at the Lapa after the early morning bushwalk or mid day while waiting for the afternoon activities. 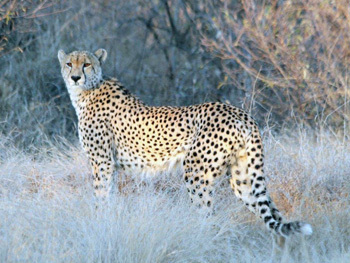 The main highlight for us this month has been the sighting of a cheetah very close to the lodge. 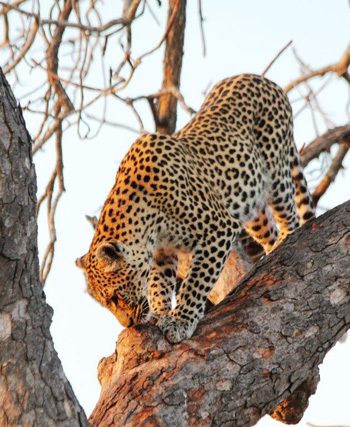 Since the launch of the bush braai at Marula Boma we have had nothing but great reports from our excited guests. Our aim is to give the guests a real feel of the bush with a great view of the beautiful African sky. To enhance the experience we will be adding on more lanterns and we are done with the construction of a new store room. The team at Tremisana Lodge welcomes a new addition to our family Alistair McKerrow. Alistair has been appointed as assistant manager. 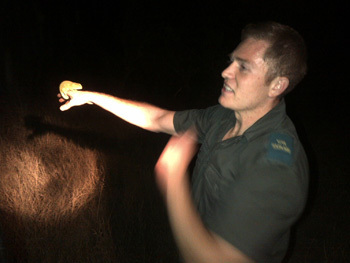 He is a fully qualified ranger and is assisting with game walks and drives. August was very good month at Marc’s – we have seen lots of wild life coming into the arera of our lodge, searching for green grazing. We had some lucky guests who, after Kruger park safari, on arrival at Marc’s front gate saw the leopard that frequents that area. We have introduced a new look to our tree houses – a touch of the modern age – our tree houses now boast sliding door and huge shatter proof windows overlooking the river. Wildlife drinking from the river bank and beautiful birds can now be enjoyed from inside the room. We are busy completely re-thatching unit 10. 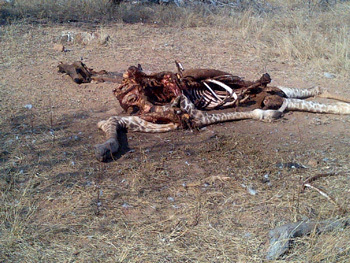 The lions killed a giraffe only 20 metres from the Marula Boma. Our guests had an enviable experience listening to the roaring of lions interspersed with the whoops of Spotted Hyenas and the wails of black-backed jackal – an unforgettable bushveld predator symphony ! We have completed a large storeroom and have built a bedroom so that, sometime in the future, we may employ a full time member of staff here. We will finalise the rates for Fly-in safaris and Luxury Lodge safaris only by early October. I shall send these to you as soon as I have received details from suppliers. We have added another Quantum to our fleet – these really are such tough and durable vehicles – and we have employed a new mechanic to oversee all our vehicles. Good news at last re petrol price – we are pleased to know that there will be a drop in the price for a change – let’s hope there is no rebound anytime soon ! My family and I stayed at Marc’s Treehouse Lodge during a 6-day safari at and around Kruger National Park. It is a delightful place: the staff are friendly and helpful, the treehouses comfortable and clean, the food is delicious, and the setting is breathtaking. The accommodations are a mix of treehouses and cabins built on stilts on the side of the slope to the bordering river. They are rustic, but very charming and comfortable. The dinners and breakfasts were delicious and we all enjoyed the company of staff and other guests. Perhaps best was sitting by the fire after dinner, chatting and playing music. Practically perfect in every way! My wife and I and our 2 adult children loved every minute of our stay. Our family of 4 stayed at Teminsana as part of a five-day safari and we loved Terminsana. It was beautiful and clean and our youngest child loved the monkeys that visited the lodge in the afternoons. 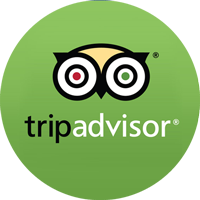 Everything was clean and tidy and the staff were wonderful – extremely welcoming and helpful. It was good to have adequate time to relax and enjoy the facilities as well. The outdoor dining areas are lovely – very relaxing. Would love to visit there again. Great for families. This was my second trip to Tremisana – the first one was a solo trip of around 6 years ago which was so good that I wanted to return, this time with my partner and her teenage children. A lot has changed over the last 6 years, almost all of it an improvement on what was already a first rate experience. Viva Safaris look after clients from the moment of arrival at OR Tambo airport – the (included in the price) transportation to and from Jo’burg at the beginning and end of the trip is reassuringly efficient – you immediately feel in safe hands. The next positive has to be the quality of the staff – the manager Rai with her ever present smile and the the guides (thanks Bongani and Luke) were first rate, combining knowledge and experience with good humoured banter. Between them they managed to show us all of the Big 5 as well as many other beautiful sights – they really were Top Notch. Other guests spoke just as highly about their guides too – what stands out is the guides’ love of the animals, they are just busting to share their interest with guests.